Women's History Month may be coming to an end, yet every day SCP lifts up women--because women lift up the world! Today, we lift up phenomenal women in leadership. We had the opportunity to lift up ten powerful, passionate, trailblazing women—we are grateful for their leadership and contributions to our community, and we hope you can join us in celebrating them! Sandra Ware: President of Avail Concierge Services, Inc.
Nearly four years ago, Strategic Community Partners (SCP) was founded—with a believe that communities and their every day citizens have the solutions, are the leaders, and deserve passionate, excellent, ethical leadership. Every day, SCP has the honor and privilege of working in communities that raised our team members, in communities we are passionate about, communities where we live and/or raise our own children. Each day, we partner with organizations furthering education, equity, and justice—by pairing community and cultural context with exemplary strategizing, planning, management, and execution. It is also critical that we continue to build our team’s capacity, talent, and diverse perspectives—all toward living out our vision and mission as an organization. We are excited to hire for our next three roles, including a Communications Manager, Executive Assistant to the President, and Manager of Education and Community Initiatives. You can view our job descriptions and deadlines (starting Friday March 22, 2019) here. If you are interested and fulfill the description for a given role, we hope you apply! If you know someone you believe would be a strong candidate, please share this opportunity with them! We are only four years in and we have a powerful, exciting road ahead—we are thrilled to continue to grow our SCP team to scale and evolve our collaboration with community and partners, ultimately furthering our collective impact. SCP welcomes a new team member! SCP is continuing to grow our team--to grow our collaboration with partners and our impact! We are thrilled to welcome Marcus Sumrall as our Manager of Educator Talent! Marcus brings expertise in talent and recruitment--with a specific lens toward education--as well as social media and communications. He is charged with leading Teach 313’s recruitment and retention efforts to ensure we are making Detroit the best city in America for teachers (and have a robust pool of teachers, decreasing teacher vacancies and attrition)--in partnership with Early Childhood and K-12 leadership and educators working toward this in Detroit each day. With a passion for education and a strong skillset in communications and relationship-building, Marcus led recruitment efforts for City Year Detroit. Recognizing a strong track record, desire to grow his capacity, and potential to lead on additional fronts, he was promoted to Regional Recruitment Director. In this role, Marcus led recruitment across the region, managed a team of ambassadors, as well as created and executed social media strategy. These efforts contributed to significant growth of brand awareness, engagement, applications, and, ultimately, incoming City Year corps. After the greater part of a decade with City Year, Marcus desired to be more rooted specifically in Detroit, where he lived and was deeply invested--as a professional, community member, husband, and father. He transitioned to Eastside Community Network where he coordinated community relations efforts, including engagement initiatives, events, as well as overall website management and additional creative support. Throughout his career, he has also contributed to community-based and start-up organizations’ talent recruitment, social media, and overall communications infrastructures--including coaching and building capacity of local organizations to sustainably operate these wheelhouses within their respective organizations. Join us in welcoming Marcus to the SCP team and learn more about his background, expertise, and passion for education and talent here! I know first hand the importance of a building and creating a strong support system of women on whom I can lean on. Throughout my professional career I have had many women pour into me when I needed it the most. In fact, early in my career I experienced imposter syndrome in a professional role. This fear that I was not enough for my role would at times be all-consuming, but my mentor coached me on how to mediate and overcome this fear. She set me aside, encouraged me, and reminded me that I was not alone. Her continued encouragement has helped me advance in my career. Without the support of other women, I could not have navigated my way through the ups and downs of being in a professional career in today's workforce. Having relationships with strong and intelligent women, who's only motivation is our well-being provides us with a myriad of opportunities to grow--professionally, personally, civically, to name a few. Magic happens when women come alongside one another. We help each other become the best version of ourselves. Strategic Community Partners understands the importance of women supporting women. That is why we have partnered with Rebel Nell and Coalition on Temporary Shelter (COTS) on Woman 2 Woman, a networking event for women by women. This event on January 31 at Bamboo Detroit, from 11:30am-1:00pm is open to seasoned professional and emerging professional women. Our hope is that we are able to form a network aimed at the professional development of women provided by women. In addition to the networking aspect of the program, we will be hosting a pop-up shop of professional attire for women involved in Coalition on Temporary Shelter (COTS). If you have any clothing you’d like to donate, Donations will be accepted until January 25. Donation drop off at Bamboo Detroit, 1420 Washington Blvd., Detroit, MI 48226. We look forward to your support and engagement! As I reflect on our mission-driven work at SCP, it’s undeniable that community engagement is paramount. In my role as Director of Community Engagement, I not only constantly review trends and research strategies focused on Community Engagement, yet I directly engage with those we serve in all we do--as those we serve are our community. I’ve found that community engagement can be operationalized in many ways--from feedback to community events--but the important role it plays in decision-making and strategy is consistent. If you intend to successfully work with and in the community, it is important that you engage the community. This engagement will directly affect the longevity of your business or organization. I firmly believe that community engagement inspires human connection across diverse groups of people, this is why it is my passion. Community engagement allows folks to come together because of a shared interest and for the common good. In my first two months at Strategic Community Partners (SCP), I have seen first-hand, the importance of community engagement and why it matters to our mission-driven work. On November 9, we partnered with United Way of Southeastern Michigan and over 75 other community organizations and stakeholders to host over 1,500 high school freshmen from Detroit Public Schools Community District at Ford Field for the second annual 2018 Find Your Future: Career and Exploration Fair. Every aspect of this event was designed by engaging the community--from discussions with our partners, facilitators, volunteers, and most importantly, our students. This event brought together people from many different backgrounds; working alongside one another for a common goal: The future of high school freshmen. This event is one example of how our community comes together to further the interest of Detroit youth in diverse career pathways, college attendance, and engagement with resources that support them along their journey. There must be a strategy in place to help guide the efforts to engage a community. Don’t define your goals before you engage! People want to feel a part of the process and projects that affect their communities. It is important to embed community in all of your operations, you can’t silo the work--it has to be a part of everyone’s role. Create your strategic plans with the community at the center—this will produce better outcomes. Ultimately, community engagement helps all people in our communities. It helps us to share, to listen and to understand one another; and at the end of the day, people want to be heard, understood, and supported. This is foundational to community engagement. And this is the heart of our work at Strategic Community Partners. Building a Toolkit: Can Restorative Practices Advance Equity? While visiting partners in Washington D.C., I was struck by a critique of cultural competence. Robert Simmons, Chief Executive Officer at Maya Angelou Schools/See Forever Foundation and long time partner of Strategic Community Partners, critiqued professional development aimed to build cultural competence as insufficient. He asserted that training and development needs to be aimed toward equity. Robert suggested that training should start at equity literacy and not cultural competence. As an educator and lifelong learner, I was fascinated by the use of a literacy model to guide professional development around diversity and equity. I reflected on the ways that capacity building intersected with equity and questioned How. I began researching the work on Equity Literacy by Ed Change to determine the scaffolding necessary to develop equity literacy. As I researched this model and the four abilities of equity literacy (the ability to Recognize, Respond to, and to Redress biases and inequities, and the ability to Sustain equity efforts), I couldn’t help but wonder, How can one inspire educators and leaders to develop and practice equity literacy? As I grappled with this question, I remembered a leadership training hosted by Black Family Development, Inc. that I had previously attended. This training on Restorative Practices shared the fundamental unifying hypothesis of Restorative Practices per the International Institute for Restorative Practices. This hypothesis, that “human beings are happier, more cooperative and productive, and more likely to make positive changes in their behavior when those in positions of authority do things with them, rather than to them or for them” aligns to the work required in equity literacy development. Restorative practices offer both practical applications and a theoretical paradigm to build relationships, forge community, and restore harm. The underpinnings of Restorative Practices are helping me to answer the question of “how”. Restorative Practices teach that we all have value and should all be treated fairly, that human relationships are best when there is free expression of affect or emotion, and that there are healthy processes we can implement to respond to conflict. And I believe that if one can leverage Restorative Practices as tools with leaders and educators, one can inspire them to develop and practice equity literacy. However, I know Restorative Practices are only a piece of the puzzle to advance equity in an organization. What are other resources have you used in your organizations to advance equity? Share your thoughts! SCP welcomes our first Director! SCP is growing our team to continue to grow our partnerships and impact! We are excited to welcome our first Director of Community Engagement—Jennifer Presley! Jennifer joins us with a wealth of knowledge and expertise in events, community engagement, strategic planning, and public-private partnerships. She is charged with continuing to grow and strengthen our community-driven events locally and nationally with an eye toward public-private partnerships to collaboratively sustain the work of powerful communities. Jennifer Presley has experience in both the private and public sector. Most notably working in Community Affairs and Special Events with the Detroit Tigers, she desired to more directly work with, in, and for communities. Taking an array of strategic planning, community engagement, and data-driven decision-making skillsets, Jennifer joined Focus: HOPE’s team to serve as the organization’s first leader of Event and Cause Marketing. In this role over the years, Jennifer created and launched several signature events and led other existing programming. With a keen eye on inclusive community engagement and collaboration, Jennifer re-introduced specific populations to Focus: HOPE, such as the Young Professionals Committee that is now integral to engagement and key efforts for the organization. She also established several public-private partnerships for the organization. Jennifer’s expertise in strategic, inclusive, and innovative events are necessary and critical in community work--providing the lens and capacity organizations need to live out their missions to the fullest extent. Join us in welcoming Jennifer to the SCP team and learn more about her background, expertise, and passion for mission-driven work here! As a child, I was enamored by the architecture of the Renaissance Center. It was industrial and modern and didn’t quite fit into the archetype that was the Detroit Art Deco Skyscraper. Still it was beautiful in its own regard and without it our skyline would be incomplete. I suppose it was a symbol for how I felt in Detroit--always looking for something new, but also feeling radically connected to the Detroit ethos. In my adult life, this connection has become even more ubiquitous--a connection inherent in my work, social life and most notably in my personal assets. Assets which include my hustle, passion, and resilience. Assets which not only stem from my upbringing in Detroit, but have been reflected in the mission-driven work I’ve engaged in throughout my career and especially since my homecoming this June. When I returned home this summer, I jumped head first into the launch of SMASHxWayneState. As the Residential Director, I led a team on the development of a residential curriculum that fostered social awareness, civic engagement, and critical thinking to encourage the next generation of Detroit youth to reach their full potential and achieve their dreams in STEM. Though my hustle shined all summer, the hustle of our Detroit youth was unmatched. From networking with key stakeholders, to developing business plans, these scholars spent 5-weeks of their summer working their tails off--by choice. It is this hustle that has become synonymous with Detroit, and this hustle that informs the Detroit Renaissance. and was moved to tears by the immense passion for and dedication to black and brown youth in Detroit. But this passion is not unique to this collective. Since coming home, I’ve been reminded of my roots, have felt more connected to work, and witnessed a deep sense of ownership and commitment to the Detroit (my) community. This passion, I imagine, is the same passion that ran through Berry Gordy’s veins when he established Motown records, and it is the same passion that fuels the Detroit resurgence. While I have had amazing experiences since returning home and throughout my career, it wasn't always easy. I grew up in a single parent household and relied on public assistance for survival. As a child, this didn't feel like a badge of honor--but rather a burden. However, it is this same experience that has helped me persist in the face of struggle today. And it is this ability to overcome that is the quintessential Detroit. A characteristic that I see manifested daily through our Detroit educators. As I sit in conversations about Teach313--a movement to make Detroit the best city in America for teachers--I am filled with pride that I was educated in Detroit Schools, and that my legacy is the result of some of the most resilient role models in the world. My homecoming is a testament to the Detroit renaissance--there are places and spaces that are new and unfamiliar, but the ethos of Detroit remains unscathed. Detroit’s current renaissance does not diminish the hustle, passion and resilience that has always been here, and I am incredibly excited for the opportunity to rejoin the Detroit Renaissance with SCP and our community partners and to continue to share and claim these Detroit-native assets. SCP welcomes our first Managing Director! We are thrilled to welcome our first Managing Director—Jessica Jackson! Jessica will be joining us as a senior leader with the organization, charged with continuing to grow and strengthen our strategic efforts and forward-thinking collaboration with partners locally and nationally. Jessica Jackson has worked within a myriad of educational contexts addressing access, retention, and success of diverse students. 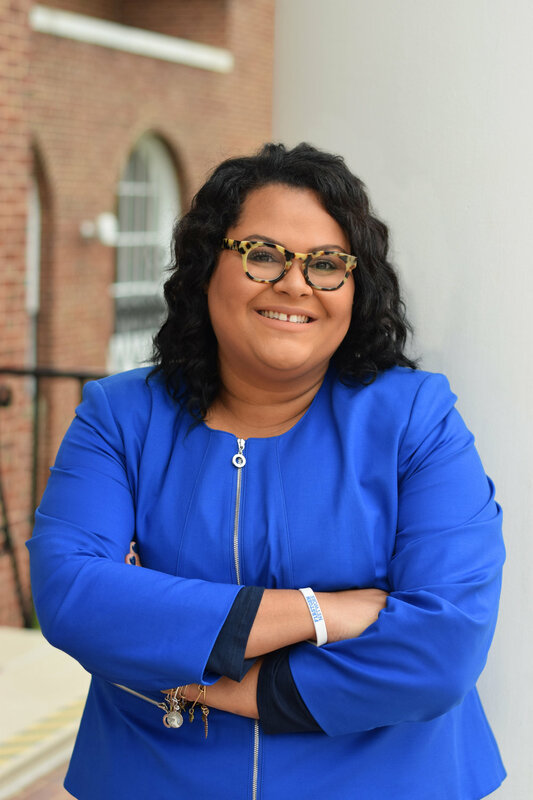 Her passion for diversity, equity, and inclusion are at the core of her work; and she has been recognized at the international level for her advocacy and strategic program development. Her expertise in strategic planning, assessment, and program development coupled with her dynamic facilitation and training skills, enable her to create sustainable impact within organizations. Join us in welcoming Jessica to the SCP team and learn more about her robust career, passion, and impact here! An SCP Team Member Returns to the Classroom! Join us in celebration! Over the past three years, Strategic Community Partners has collaborated with our partners to propel forward powerful missions. Two years ago, Alaina Dague joined our team as a consultant. For the past year, Alaina has served as our Manager of Partnerships and has helped us scale and evolve our work. While we are beyond thrilled for another great teacher to return to the classroom, it’s also bittersweet. “The mission and work of SCP continues to resonate with me and I will certainly miss working with the team and our partners.” Alaina is part of the SCP family--and our partners love her. She will still be a close friend of SCP and even continue to engage and support from time-to-time, yet for now--we are ecstatic to see her return to the classroom! Please join us in celebrating Alaina--her work has impacted thousands of students, parents, community members, and beyond across Detroit, DC, and nationally! Strategic Community Partners was born with a vision of catering to mission-driven clientele through partnering strategy with community and cultural context. As the national demand for our work has grown, our team has reflected on the quality and strength of all of our innovative partners and leaders that have been collaborated with us along the way! Our #CommunityLeaders initiative is a space created within social media, uplifting influencers of change, as well as encouraging more meaningful dialogue across social media channels. Why do you do what you do? What continually motivates you to stay in this work? Playworks is a phenomenal organization that delivers evidence-based services to school districts and youth-serving organizations to help improve the school climate and culture for its partners. Additionally, those services are feeding into a much larger social change movement to reach 3.5 million children by December 2020 with safe and healthy play. Being a part of a movement is inspiring and challenging, which keeps me motivated to stay in the work. Play is a universally accessible tool to children and adults, has the power to bring out the best in everyone and it is an honor for me to share it with others. What factors allow you to succeed in your role? I think movement building or systems change work is always going to be a bit like swimming up stream. There are inherent challenges and resistance in change. Possessing grit, passion and perseverance are key to being successful in any role. I also think hard work and a strong work ethic are paramount to success as a leader in any role. What does being a strong community partner mean to you? How do you live that out through your work? Being a strong community partner means that we are dependable, we put integrity and transparency first, and that we assume positive intent when interacting with our donors, customers and the kids and grown ups we serve. It means we are accountable and willing to take responsibility for our actions. I live this out through my work by using Playworks' core values of Respect, Inclusion, Healthy Play and Healthy Community as the benchmark for all of our decisions. Our culture matches our mission and we strive to be a mirror for how we want to imagine the world around us. For example, if we are asking schools to prioritize play and recess then we must do that for ourselves. Therefore, we hold recess in our office a number of times a week and schedule time outside of the office regularly to play together. 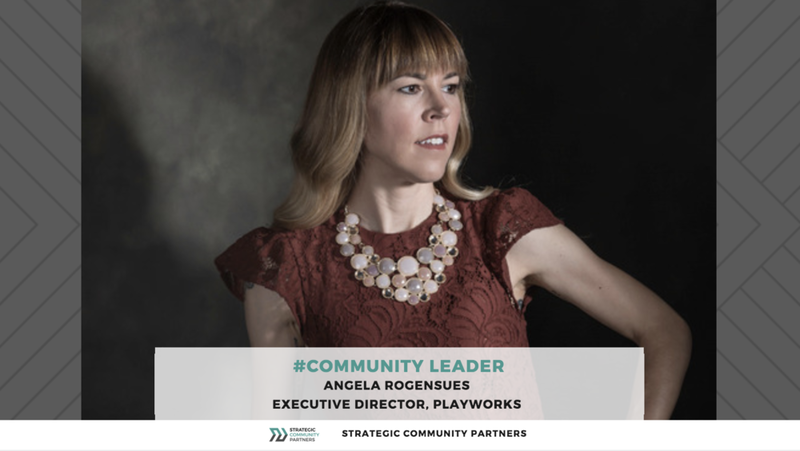 Angela Rogensues currently serves as the executive director of Playworks Michigan. Playworks partners with schools, districts, and youth-serving organizations to provide on-site coaches, consultative services and professional development training. Angela believes in the power of play to bring out the best in every kid. Since joining Playworks Michigan as program director in 2012, Angela has increased program impact by 38 percent, reaching 17,000 children in the 2017-2018 school year. She was promoted to executive director in 2015 and has increased revenue by 64 percent. Angela is a recipient of many notable awards. She was most recently named one of Crain’s Detroit Business “40 Under 40.” Previously, she was named one of DePaul University’s “Success Stories: 14 Under 40 Alumni”, a recipient of the “35 Under 35 Leadership Award” presented by the Community Renewal Society of Chicago, and appointed by the then Mayor of Chicago, Richard M. Daly as a member of the City of Chicago Commission on Human Relations Advisory Council on Women. Rogensues is a current board member for the Founder’s Junior Council of the Detroit Institute of Arts and a founding board member for the Detroit chapter of Women in Sports and Events. Angela holds a Bachelor of Science from Michigan State University and a Master of Arts from DePaul University. I continue to do this work because the inequities and injustices in our society persist and the need for education, involvement, and transformation endures. I originally founded the Southwest Michigan Black Heritage Society because I realized there was no organization researching and documenting the history of African Americans in our area. In 2010, after our involvement with the Race Exhibit Initiative, we saw there was a role for us in promoting racial equity and racial healing. I continue to do this work because the inequities and injustices in our society persist and the need for education, involvement, and transformation endures. My passion for what I do and the dedication and support of our volunteers and board members allow me to succeed in my role. It means staying atune to the needs of the community and using your resources and abilities to work towards meeting those needs. Obviously, we can't do everything for everyone, so it's important to identify where you can best serve with what you have to offer. I have tried to utilize the knowledge and skills I've developed over the years in the areas of management, planning and development, research, and education to build and grow our organization. 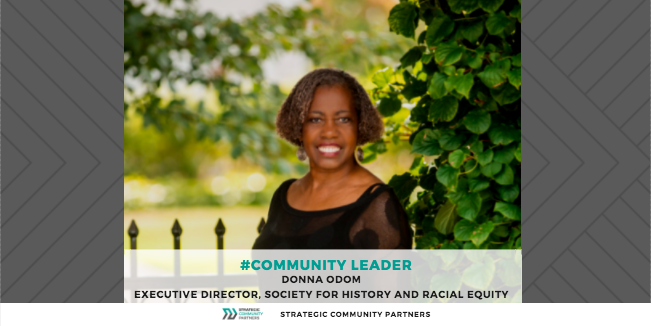 Donna Odom is founder and Executive Director of the Society for History and Racial Equity. She holds a B.A. from Kalamazoo College and an M.A. from Loyola University, Chicago. Ms. Odom’s background includes several years teaching in community college and high school. She was Director of Cooperative Education for the eight city colleges of Chicago and Manager of the Business Access Center at Chicago City-Wide College before returning to Kalamazoo in 1993. She retired as Coordinator of Educational Programs from the Kalamazoo Valley Museum in 2010. Ms. Odom was a member of the steering committee for the Southwest Michigan RACE Exhibit Initiative, is a board member of the Historical Society of Michigan, the Kalamazoo County Historical Society and past board member of the Michigan Oral History Association and the Friends of WMUK Advisory Committee at Western Michigan University. I continue to work in the nonprofit sector because of the reward of clearly seeing the local impact of the work that I do on a day-to-day basis. Because of the constant interaction with students, families, and other community members who participate in programs and provide feedback and become supporters or volunteers themselves, you have a constant reminder of why that work is important and the difference it makes in the community. Most days, my best moments are getting feedback from people who've benefited from a program I've helped support or hearing an update from a student I've worked with in the past about how their experience in a program has helped them be more successful or more prepared for their next step in higher education or professional life. Being a part of teams with committed coworkers and board members has been incredibly important in allowing me to be successful in my role. As with any organization, the nonprofits I've been a part of have experienced periods of uncertainty and challenge; because of the mission-drive nature of the work, it's still important to try and continue to deliver services to community members who depend on your work every day. Being able to call on coworkers to assist with projects, come up with solutions to unexpected challenges, or get support and motivation after a particularly tough day has been crucial for my success. I've also been fortunate enough to work with many supervisors and mentors who have given me the space, resources, and support to continually look for opportunities to learn new skills and take advantage of external professional development opportunities. The knowledge and skills I've been able to bring back from talking to new contacts at different organizations allowed me to offer new solutions to make my own agency more efficient and effective. I think being a strong community partner is centered around being collaborative and supportive of the work of others whenever possible. Even in situations where you may be doing similar work to other people, by helping to make them better or offering information about resources and opportunities, you are ultimately helping yourself and other people will take notice of that. In my work, I try to demonstrate that value by being intentional about providing help to others whenever possible, even if in short-sighted terms, they may appear to be a rival in terms of applying for grant funding or doing similar community-based work. In my coaching work with students in the Braven program, I try to highlight one of their core values, which is "Go Together, Go Further"; being a strong partner means realizing that by helping others, you are helping yourself and the larger community. Jeff Key is a lifelong resident of New Jersey and currently lives in New Brunswick. He attended Princeton University and is also a graduate of Seton Hall University School of Law. For the past 12 years, he has worked with educational non-profits focused on providing resources for college access and high-quality academic programming to students across New Jersey. He is currently the Director of Operations for Project U.S.E., a nonprofit that provides experiential education programs such as boat building, urban gardening, and wilderness courses to young adults throughout New Jersey. He is a proud AmeriCorps alumni and currently volunteers as a leadership coach for Braven, a nonprofit providing high-quality leadership coaching and professional development for first generation college students to increase the pool of diverse leaders in the workplace. He is also involved with the Young Nonprofit Professionals Network (YNPN) providing support to chapters nationwide as a NationBuilder Integration Coordinator and Network Engagement Associate, and as an active board member for the New Jersey chapter (YNPN-NJ). In his free time, he enjoys attending concerts, playing sports, trivia, karaoke, and taking road trips. At Strategic Community Partners, we are committed to empowering and celebrating women--women on our team; women we partner with; women we serve; women in general. Today, on International Women's Day, we asked a few members of our team to reflect on their experience engaging in mission-driven work at a women-led organization. Mission-driven work is my life’s calling--I’ve known that since I was a child when, at the age of seven, I boldly declared I would be a civil rights attorney. Fast forward 12 years to when I was a senior at the University of Michigan and was on my way to law school. Working for a social justice and advocacy organization, the American Friends Service Committee, as a free legal advocate for those incarcerated in Michigan prisons, I decided I did not want to study in law school, but rather wanted to prevent cases by engaging with youth and helping them understand and walk in their greatness. This was deeply personal to me, as it was also a preventive strategy to ensure my community, and so many other marginalized communities, weren’t getting caught in the system. My family and my mother ingrained mission-driven values in my DNA--and I’ve been fighting the good fight ever since. As for the intersection of gender and work--if you’d asked me before starting my company what the most salient part of my identity was, I would have told you: my race. Three years ago, I launched Strategic Community Partners (formerly Hampton Consulting)--and since then, my answer to that same question is: my gender. For all of it’s glory, I am a woman. Our power, our resilience, our passion...I am a proud woman. Furthermore, I am the proud, humble, and grateful Founder and President of Strategic Community Partners--a national organization committed to collaborating with mission-driven organizations to lead strategy and provide capacity-building. For me, this experience has been a wonderful professional whirlwind and a powerful experience in my personal life. For our amazing SCP team and our partners, I do not take it lightly what I represent and who I represent. For my team and partners to be able to see a strong Black woman leading an organization that has rapidly grown and has a strong brand and reputation, I look at this an opportunity to pay homage to those whose shoulders I stand upon, as well as continue to build a legacy of phenomenal women. We each have pieces of our identity that are core to who we are and why we do what we do. Being a Black woman is core to who I am; and through this wonderful, deep, rich identity, I am blessed to lead in this work and do this work each day. This year’s theme for International Women’s Day -- Press For Progress -- deeply resonates with me. The World Economic Forum’s Global Gender Gap Report last year found that gender parity in income, employment, education, health, and political engagement is still more than 200 years away. Especially now, I am humbled and honored to work at a mission-driven organization so deeply committed to promoting gender inclusion and equity. At Strategic Community Partners we proudly lift up and support women leaders, both within our organization and throughout the greater community. My commitment to relentlessly #PressForProgress on this issue will remain unwavering throughout all that I do. This dedication is further bolstered by the knowledge that I am working in concert with the phenomenal women of SCP, the women leaders who we partner with and serve, and women in this work who I have yet to even meet. I am hopeful that the greater social movement in pursuit of gender parity only continues to grow, until all women have access to and are empowered to pursue their dreams. Today, there are so many black women in mainstream media that young black girls can look up to. That makes me so happy because growing up, I didn’t have that. I didn’t have a Michelle Obama, a Viola Davis, or an Ava DuVernay. That being said, representation truly matters, and I aim to represent people of color -- especially women of color -- through film. I am blessed to be doing this work at such an amazing women-led company that caters to mission-driven clientele, helping them achieve their goals by pairing strategy with community and cultural context. Being the Media Coordinator at Strategic Community Partners has already opened so many doors for me, both career-wise and on a creatively. As a black woman, I love being able to capture the diverse voices of our core staff and our partners, and to meet so many inspiring women doing mission-driven work to better their communities. It’s beyond inspiring to work at a company like SCP that uplifts women, diverse voices and stories, and serves as the representation that I wish I had growing up as a woman of color. Strategic Community Partners is proud to be a women-led organization and is committed to empowering and celebrating the women on our staff. As Women’s History Month begins, we asked a few members of our team to reflect on their identities in this work. If you would have asked me what the most salient part of my identity was four years ago, I would have said my race. After launching Strategic Community Partners nearly three years ago and since then, I will hands down say that my gender is the most salient part of my identity. Furthermore, as a woman of color, I do not take it lightly and am constantly reminded of my power, my resilience, and how far we have to go as a society. It means the world to me that my students, my younger relatives, and beyond can see a woman in power--because for far too long, this wasn’t the case; and even today, we still often see limited female leadership. It is also critical to me that I foster an organizational culture which uplifts, empowers, and celebrates women. I am both proud and humbled to be the founder and president of an organization that is known not only in my hometown of Detroit and home state of Michigan, yet in our nation’s capital (where our second Strategic Community Partners office is located), and across the country. For 2018, the National Women’s History Month theme is “Nevertheless, she persisted: Honoring women who fight all forms of discrimination against women.” As many of us in this work know, this refers to remarks made by Senate Majority Leader Mitch McConnell when, despite his objection, Sen. Elizabeth Warren continued to read a letter from civil rights leader Coretta Scott King condemning then-Sen. Jeff Sessions as the Senate debated Sessions' nomination to become U.S. Attorney General. This brief comment -- “Nevertheless, she persisted.” -- sparked a movement celebrating the tenacity and determination of women throughout history and across the world. As I reflect on this theme, I am especially proud to be working at a woman-owned and women-led organization; at an company where women are intentionally developed and supported; and at an organization where my voice as a woman and as a professional is deeply respected. At Strategic Community Partners, we have lived out our commitment to inclusivity, representation, and excellence in building a team of phenomenal women leaders. I am honored to work among, and be one, of these women. I knew I wanted to change the world and make an impact in my community at a young age. It is important to me to be doing mission-driven work as a woman - a black woman - and to be a catalyst for change and equality. In film and media, the industry is largely dominated by white men. So, being able to work in an organization that consists of women doing the same work that I am committed to doing is nothing short of inspirational. Working at a women-led organization not only gives me hope that more women are taking on leadership roles in their organizations and communities, but also reminds me that we are working endlessly to have a seat at the table in order for our voices to be heard. To me, that is what Women’s History Month means. It is a reflection of those who came before us, those in the present, and those who will come after us that have, are, and will do the work necessary to ensure equity and inclusivity in our society. As a filmmaker, videographer, and the Media Coordinator for Strategic Community Partners, I aim to leave my mark on the world through film, telling stories of social justice, human rights, and the experiences of people of color. In that, I advocate for more women, especially women of color, to be included in the industry. Our stories matter, and I aim to tell them not just during Women’s History Month, but even after as well. Our Special Projects Coordinator, Tori Lee, joined the Strategic Community Partners team in a short-term capacity last fall. We knew she’d be heading off to the Peace Corps this spring. We also knew she was a talented and passionate mission-driven leader--we had to have her on the team! We are so grateful for her contributions to our team over the past five months. Please join us in wishing her the best of luck and read her reflections on her experience at Strategic Community Partners. After graduating from college with a degree in International Relations, I assumed that I would be galavanting across the world, doing incredible and engaging work, just as I had done throughout my undergraduate career. I never quite expected to find myself working for a mission-driven organization based just a few hours north of my hometown. The truth is, though, that there is a lot to do here in our own backyard! While in school, my textbooks often showed faces of global poverty and social injustice in other countries while neglecting to highlight the fact that the United States is also experiencing those very same challenges. It’s a hard truth to face, but a truth, nonetheless. Our students are not all experiencing equitable access to quality education, for example. While that can seem like an overwhelming, frustrating and even impossible challenge for one person to solve, the biggest lesson that I learned in my time here is that you don’t have to go at it alone. Amazing and innovative organizations, like Strategic Community Partners, are in communities everyday working to uplift voices and catalyze change. Inch by inch, these leaders work to ensure that students are emotionally taken care of, parents are uplifted and empowered to support their children, and that teachers are invigorated and inspired in order to impact students. These leaders give their all every day and they gave me the belief that my voice can generate change. Not long ago, I felt that I didn’t have enough relevant experience to really make a difference in my field. I’ve since realized, however, that showing up and simply doing the work will always be meaningful. I’ve learned to trust in my skills and abilities and to value what makes me unique in this work. For example, I’ve always been someone who’s enjoyed planning (literally anything-I love a good to-do list!). I’ve been able to utilize those skills to help support a career fair that impacted over 2,000 high school freshmen as well as lead a talent collective that supported city-wide education recommendations in Detroit. Doing the work means just that: getting it done. Although I never expected to be here, I am incredibly grateful for all that I have had the opportunity to engage in and learn from while on the Strategic Community Partners team. No matter where I go in this world, I’ll never forget the lessons I’ve learned through some of the hardest-working individuals that I’ve met. As this amazing Black- and women-led organization continues to thrive, I am honored to say that I am committed to always doing the work alongside them. What does it mean to do mission-driven work? Today is World Day of Social Justice! At Strategic Community Partners, we are passionate about mission-driven work as an act of justice and working towards justice--not just today, but everyday. Some of our core team members share their reflections on what it means to do mission-driven work. Mission-driven work isn't a 9-5; it's a way of life, a deeply rooted belief in what is, should be, and what it will take to get there. At Strategic Community Partners (SCP), we work with organizations whose missions align with education, equity, and justice. I launched SCP three years ago, yet have always been committed to this work--both in my "professional role," yet also as an actively engaged citizen and beyond. 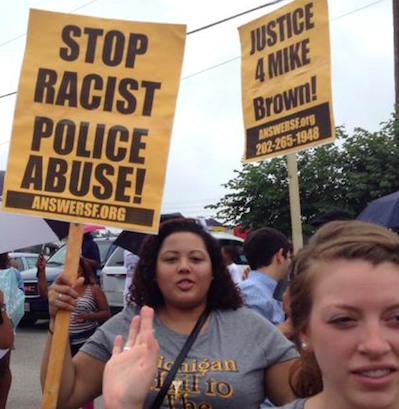 This picture was taken days after Michael Brown was murdered in Ferguson. I had just moved back to Detroit and immediately flew back down to St. Louis, taking members of my team and marching alongside my former students (who had graduated) and their families. --hundreds of us met at a church, we all couldn't fit in, so I waited in the parking lot with hundreds of people. We were beginning to march. It was a sobering reminder of what is, should be (and shouldn't be), and what it will take. We have a long way to go. I am blessed to be able to do this work, lead an organization committed to this work, and build a team and surround myself with people who are equally committed. At Strategic Community Partners, our commitment to mission-driven work echoes throughout all that we do. I am continually impressed by our team’s professional and personal commitment to our work with organizations who work in spaces of education, equity, and justice, and am deeply grateful to be surrounded by such an incredible team. As I reflect on the World Day of Social Justice, I know that I do this work for our kids, our youth. I am, and will always be, so thankful for the family, teachers, and other adults who supported me throughout my educational experiences and development. They offered advice and compassion, advocated on my behalf, and did so, so much more. As a middle school teacher, I worked hard to offer that same love and support to my students. Although I’m no longer in the classroom, I wake up every day deeply committed to continuing our work on behalf of kids like me, my former students, and for all of our youth. I live my activism daily though my work at SCP and my interactions with others. I believe deeply in the value of working with mission-driven organizations and individuals that seek to uplift communities and catalyze change. So often, mission-driven work means showing up and doing the hard work that seems overwhelming or impossible but I’ve been so inspired by the passionate and innovative partners of SCP. Everyday, these leaders show up and push for change and better outcomes for students, teachers, marginalized communities and others through their hard work and dedication to different causes. At SCP, we celebrate World Day of Social Justice every time we use strategy to help further our partners’ goals, every time we host a large community-based event and impact thousands of students lives, and every time we help raise the voices of our community members. It’s an honor to be a part of mission-driven work with such a passionate group of individuals with such varied personal experiences here at SCP and to have the relationships to the high-caliber thinkers and doers in the SCP network. Storytelling is my passion. Film is the medium. Working with organizations like SCP has allowed me to engage as a leader in the movement through a creative lens. My company, For The Culture Films, caters to telling stories about social justice, human rights, and the experiences of people of color. SCP’s mission of working with mission-driven organizations that align with education, equity, and justice perfectly balances with the work I do as a filmmaker and social justice leader. World Day of Social Justice is a reflection and reminder of why I do what I do. I do it for my people, my community, and ultimately, for the culture. Why do you do what you do? What motivates you to stay in this work? I do what I do every day because I truly believe our greatest resource in Michigan is our young people. We see people creating amazing solutions, companies, and things every day. I want to do my part to make sure our young people are aware and capable so they can create. I'm lucky in that I work directly with our students, so I see first hand the progress they are making and skills they are learning from our programs. The thing is, these students are just getting started and we want to make sure we are there to assist to where we can. Just like a good book, you're not going to close it before the end, you're going to see it through. Two things come to mind when I think about why we’ve been able to accomplish what we have. For one, we’re very dedicated to connecting our youth to opportunities that will help them become the capable leaders that we know they can be. With limited resources, that means thinking outside the box in how we develop programs that will impact their future while always paying attention to their present needs and addressing them. The second thing that ties into the first is the relationships with individuals and organizations that we’ve partnered with. We’ve been fortunate to develop great relationships with organizations like Strategic Community Partners, Emerging Training Institute, Campaign for Black Male Achievement, and Ford Motor Company Fund to name a few. Through these partnerships, we’ve been able to not only receive resources needed for our programming but also guidance and experience which has been vital for our young organization. To me, being a strong community partner means being an asset that’s able to collaborate with other partners to achieve an agreed upon goal. It also means being able to identify, assist, and connect other assets when needed. I keep this in mind every time I’m contacted to help with a program or provide my expertise. Just as others have helped with JOURNi's growth and initiatives, I make sure that we're assisting and pouring back into others. This is also apparent every time we identify a specific need our students have that we don’t have a background or expertise in. We don't look the other way, we look to locate the resource needed to give our students the best shot at winning. 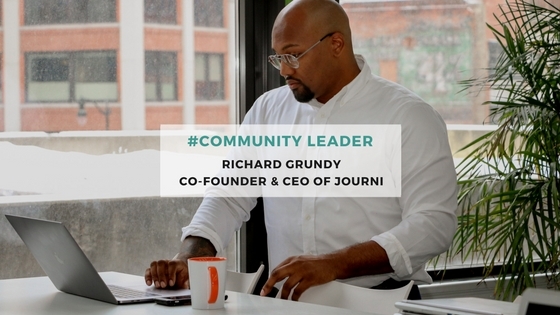 Richard, a native Detroiter is the cofounder and CEO of JOURNi. JOURNi is a non-profit focused on decentralizing tech education for Detroiters. Through partnerships with workforce development agencies, schools, community organizations and foundations, JOURNi has been able to train close to 200 youth in web-development and entrepreneurship skills vital to closing the digital divide in Detroit. Prior to moving back to Detroit to start JOURNi, Richard worked as an agile project manager to deliver web and mobile development projects. One month in, this year has been nothing short of exciting and affirming of the work we are committed to here at Strategic Community Partners! Earlier this month, we announced our new name, as well as the opening of our second office in Washington, D.C. 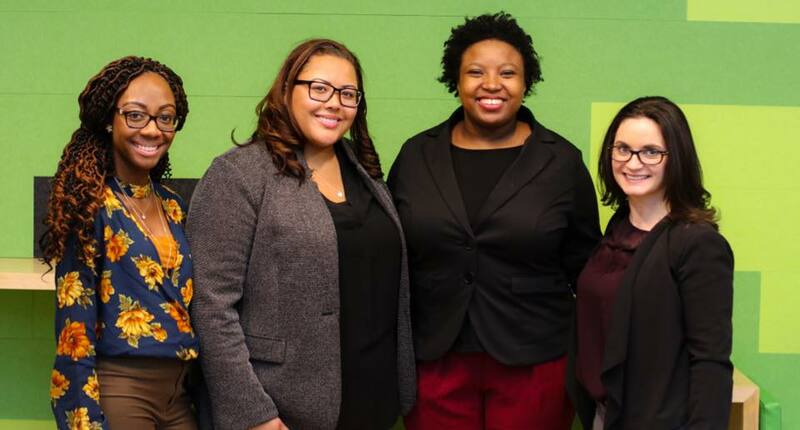 The past couple days, our Founder and President, Chanel Hampton, and two members of our core team spent time in D.C. meeting with new colleagues and partners--all passionate leaders committed to ensuring equity, justice, and excellence across the board in D.C. The need for strategic work paired with community and cultural context is just as clear in D.C. as it is in Detroit--and despite the notion that we are experiencing such drastically different environments and challenges from city to city, we were reminded that the same issues exist, largely, across our country. This is why we are committed to this work not only in Detroit, yet in D.C. and nationally. 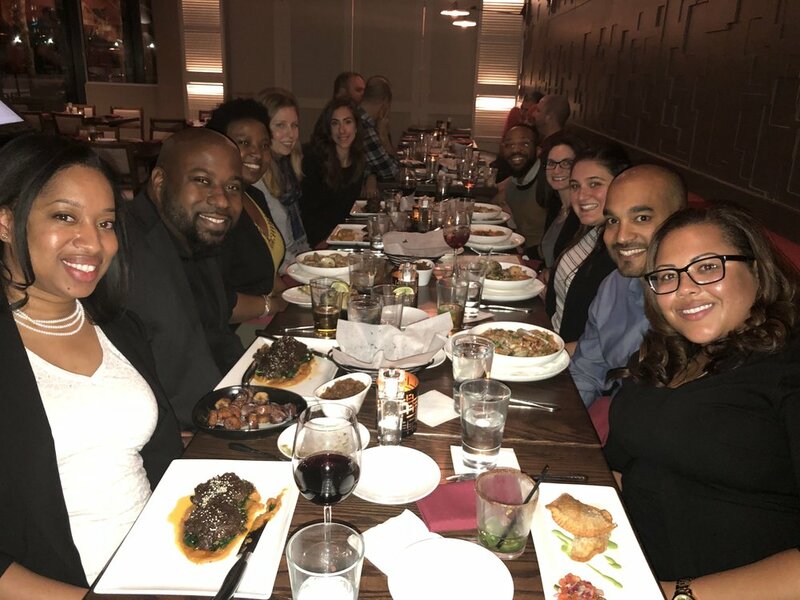 Amidst meetings with various partners and colleagues, we also had the chance to celebrate with close friends and colleagues in D.C. An informal, intimate dinner celebration was perfect--ideas were exchanged, new connections were made, and SCP was celebrated! In mission-driven work, it is often so easy to run from meeting to meeting, project to project; we believe that relationships and celebration must be part of this work, too. We cannot thank our D.C. friends and colleagues enough for your support and celebration of these milestones--and many more to come! Here's to a year filled with milestones, strong partnerships, and great company along the way! Thankful for all of our friends and colleagues who joined us to celebrate the national launch of Strategic Community Partners! A New Year and Exciting News! I launched Hampton Consulting in 2015 with a vision of catering to mission-driven clientele; pairing strategy with community and cultural context to help clients achieve their short- and long-term goals. Over the past two years, Hampton Consulting has had the opportunity to contribute to substantial impact, learn, and grow with our partners. As an organization, we have grown and exceeded all goals set forth; 2017 was a testament to the power of a vision and the need for the work we are committed to. Today, we celebrate another milestone in our organization—with a new name and additional national expansion. We are still the same organization; Detroit will always be home. As a result of our work over the past two-and-a-half years, we have found an even greater demand. Furthermore, we want a brand that communicates who we are and what we do. We aren’t consultants, we are Strategic Community Partners. We are equally humbled, honored, and thrilled to announce the opening of our second office in Washington, D.C.
We deeply value our partnerships with those who have allowed us to help them live out their missions over the past two-and-a-half years, and we look forward to continuing to do this work with and alongside them for years to come. We are also eager to grow and further expand the reach of powerful missions across the country. Be sure to follow us on our channels (Facebook; Twitter; LinkedIn) and visit our website—this month is an exciting time and we appreciate your support! Here’s to a mission-driven 2018, even stronger partnerships, and a growing impact!